Michelle Mills - Ind. Stampin' Up! Demonstrator Brisbane, Australia: Thoughtful Branches Available NOW! 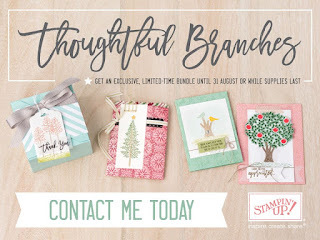 Photopolymer Stamp Set AND Thinlit Dies Bundle exclusively to Stampin' Up! So don't delay. Grab yours today, while stocks last. p.s. Keep an eye out for the Crazy Crafters Blog Hop tomorrow featuring this bundle!